Stan wrote an award-winning 3x weekly satirical newspaper column for Gannett's Marin Independent Journal, and the alternative weekly Pacific Sun. In addition, his oped pieces and humorous features have appeared in most major newspapers, including the NY Times, USA Today, Los Angeles Times, Boston Globe, NY Daily News and many others. He also writes humorous blogs for a number of clients. For more examples of his funny side, see the links to your right. MAD - Stan is a regular member of the “usual gang of idiots” who contribute to this legendary (and still-being-published) magazine. Here are some clips. WEEKLY WORLD NEWS - Stan was a “reporter” for this classic (and dearly departed) gonzo tabloid. NEWSPAPERS - Stan wrote columns for multiple news organizations. 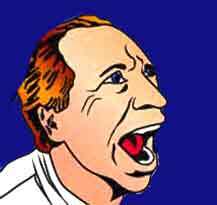 FEATURE ARTICLES - In addition to his other endeavors, Stan Sinberg writes for a variety of magazines.